After visiting Clyde's, I drove back to the Mystic Village area to start our next adventure - finding a place to have lunch. 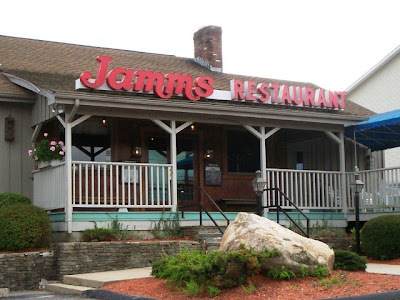 Since Mom is a smarty pants, she had previously done some research on a local Connecticut favorite - Jamms Restaurant. The menu looked really good, so all we had to do is find the place. 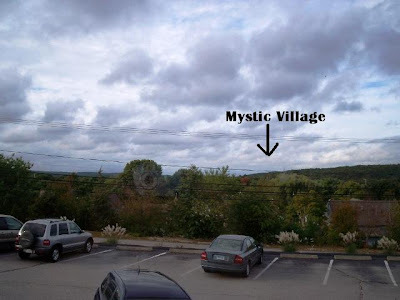 Thankfully, it is located right behind Mystic Village and right up the street from the Steak Loft. I pulled into the large parking lot of Jamms at around 4:30 p.m. There were only a few cars in the parking lot, but the restaurant seemed quite large so I was sure that the establishment did some serious business. Mom and I walked up the few stairs past the outside dining area and into the lobby. We were greeted by a young hostess, who later turned out to be our waitress. She asked us if we would like a table or booth, and we chose a booth by a large window. The waitress placed two pleather-covered menus on the table and left us to choose what we wanted. The menu at Jamms is small, but the options are varied. Appetizers range from a shrimp cocktail for $2.50 to a platter of oysters on the half shell for $10.95. 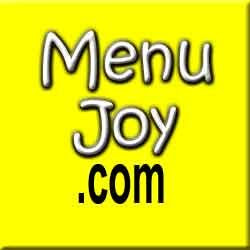 Their children's menu features dishes like Jamms Boboli pizza, Kidfish (baked or fried), and a Kidsteak for $12.95, which is a six ounce charbroiled top sirloin. Jamms has soups, salads, sandwiches, burgers, pasta, seafood, steaks, poultry, and desserts, with featured items such as the duckling, the native New England lobster, the steak and shrimp combo, and the seafood stew. Also, Jamms advertises a large Sunday brunch which includes dishes like the breakfast burrito stuffed with scrambled eggs, jalapeno bacon, cheddar and Jack cheeses, green peppers, and onions, topped with salsa and sour cream, and served with home fries or fresh fruit; the quiche; and the California omelet with spicy jalapeno bacon, Jack cheese, peppers, onions, tomatoes, and salsa. The omelet is topped with guacamole, sour cream, and sliced jalapenos on request. Liquor is also served at Jamms and spirited Jamaican, Mexican, Spanish, Kioki, and Irish coffees flavored with alcohol are available. All sandwiches are served with half-sour pickle and chips, and you can substitute the chips for fries for only $1. Jamms also has daily specials, and the sign outside boasts that all food and beverages are served from 11:30 a.m. to midnight everyday. The Sunday brunch is available from 10 a.m. to 12:30 p.m. The waitress returned to take our drink order. Mom and I both chose Diet Cokes. When she returned with our beverages, which arrived in glasses, we were ready to order. 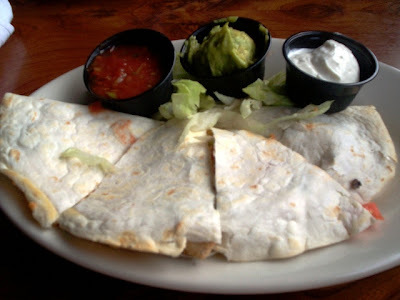 Mom ordered the fish and chips ($10.95), while I ordered the Cajun chicken and Jack cheese quesadilla ($8.95). I almost added a baked onion soup to my order, but opted not to in case the quesadilla was on the large side. As the polite waitress took away our menus, Mom and I started to scope out the interior. The interior of Jamms is quite cozy. It definitely has the feel of an older family restaurant as opposed to the craziness of a chain like TGI Friday's or Applebee's. When you first walk in, you will notice a carpeted staircase. I'm assuming this leads to the large banquet area, where groups of 20 or more are given a special rate. The place is ensconced in dark woods, maroon booths, and framed posters of various works of art. Small curtain toppers on the large windows allow patrons to overlook the picturesque Mystic Village. The silverware was wrapped in cloth napkins resting on white plates at each wooden table. There is a small bar area to the right of the entrance, and all the waitstaff were wearing white collared shirts with the Jamms logo in red - a nice touch. 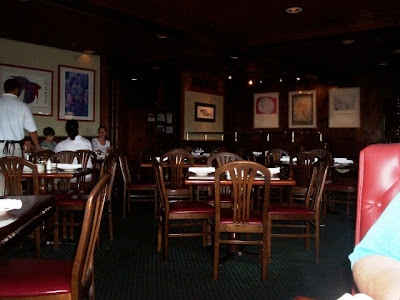 All in all, the restaurant was very clean, and the low lights and dark decor gave it a pub-like feel. The view from the window overlooking the back of Mystic Village and Aquarium. We hadn't been waiting long when the waitress brought out our dishes. 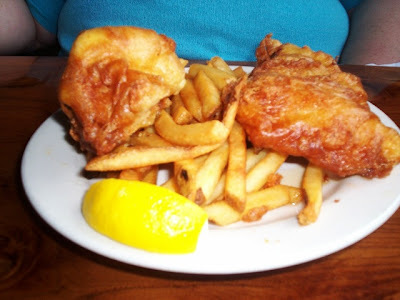 Mom's fish and chips was a good sized portion and served nice and hot. The fish was very well done and the fries were tasty. The only downfall was that it was a bit on the greasy side. However, Mom said the taste of the white, flaky fish was quite delicious. My Cajun chicken and Jack cheese quesadilla was quite tasty. Consisting of tender chicken, tangy cheese, and fresh tomato and scallion, this dish was accompanied by three small cups of salsa, sour cream, and guacamole. Although the quesadilla shell was a bit crispy, this type of meal is one of my favorites and the Jamms version did not disappoint. It was thoroughly enjoyable. We left $30.50 on the table, including 20% tip, and headed for the ladies' room. Both sets of restrooms (men's and women's) were set behind a frosted glass door. The bathroom was clean and organized, although the sink seemed to be built incorrectly as the faucet was set quite a bit back from the rest of the sink. It was nice to get away from the busy Mystic Village area, and Jamms provided us with both comfort and a delicious meal. Finding this restaurant was a pleasant surprise, and both Mom and I are looking forward to our next visit to Connecticut and to Jamms.